With the new Little Nemo comic series by Eric Shanower, Gabriel Rodriguez, and Nelson Daniel now in its third issue, I thought checking out the history of this franchise might not be amiss. I believe I first heard of Little Nemo when the Nintendo game came out in 1990, and was quite heavily promoted by Nintendo Power. I believe we rented it once. Perhaps building on the popularity of the then-recent Super Mario Bros. 3, Nemo was able to ride on some animals and gain the powers of others by wearing their skins as suits. 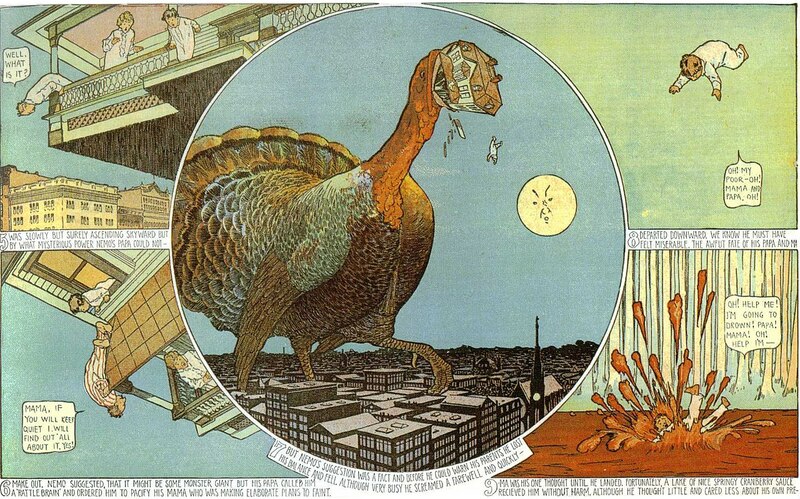 The whole thing started long before that, though, back in 1905 and a very early continuing comic strip by Winsor McCay. 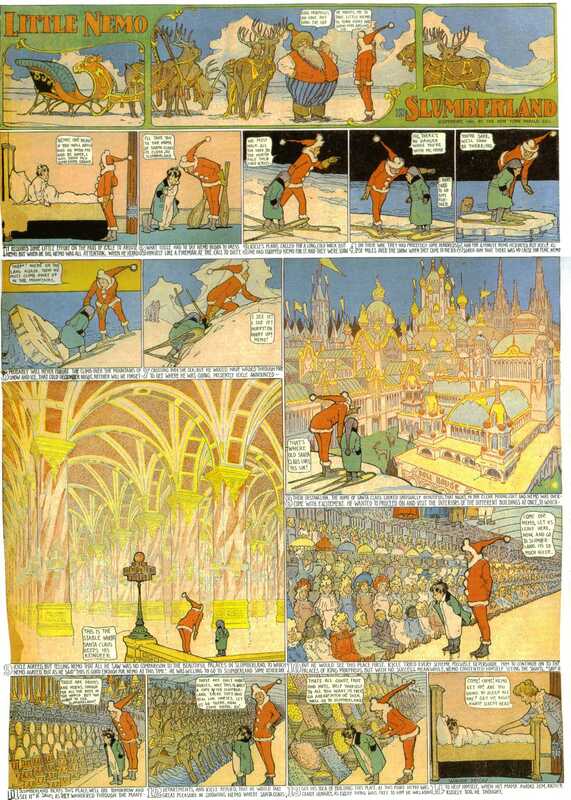 The local library system had the first volume of the 1989 collection of strips, running through March 1907. This page has the strips up through 1918, so I’ll be sure to read those at my leisure. The premise is that of a boy named Nemo who, in his dreams, is summoned to the court of King Morpheus of Slumberland to be his daughter’s new playmate. Every strip would involve him getting into a surreal adventure; but at the end he’d wake up, sometimes due to his own fear or curiosity, and other times because of the machinations of the nasty and jealous clown Flip, son of the Sun. One of his parents would then often make a comment about how he shouldn’t be eating some bizarre kind of food before bed. Fortunately, once Nemo reached the gates of Slumberland, he was able to return to where he left off with each new dream. In the earliest strips, you can see the development of McCay’s style, and how he eventually decides to leave out the running narrative as the whole story is already being told in the pictures and word balloons. It’s a good choice, as the narrative for each frame would sometimes stop in the middle of a sentence, making it awkward to follow that and the art simultaneously. The word balloons are often too small to fit the dialogue in comfortably, but then McCay was drawing by hand in a relatively new medium. What is consistent throughout is the ornate imagery, inspired by circuses and the architecture of the 1893 World’s Columbian Exposition and Coney Island. 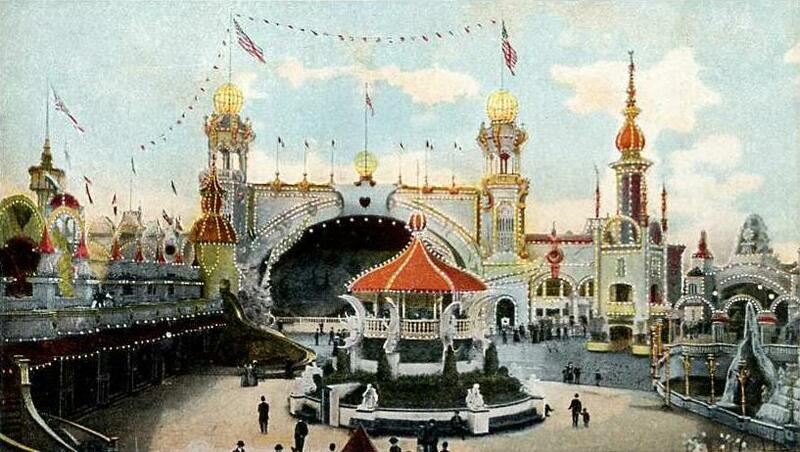 It would be nice if Coney Island still looked like that, but it doesn’t. 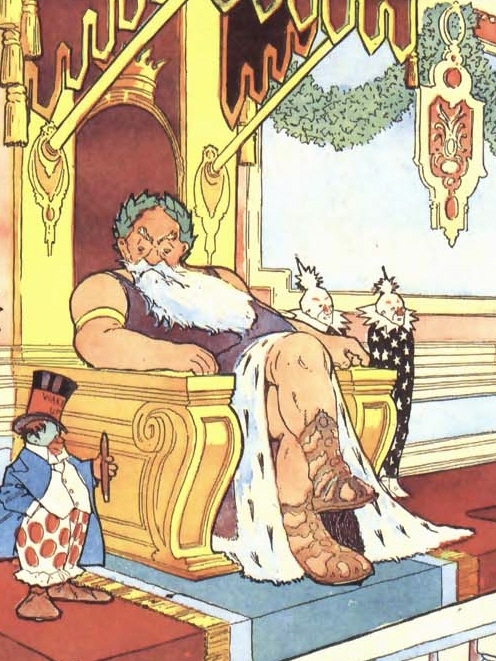 The strip only ran on Sundays, but McCay would make references to the time of year by bringing in other characters from popular folklore who were friendly with the folks of Slumberland: Santa Claus at Christmas, Father Time at New Year’s, Cupid at Valentine’s Day, Jack Frost in the winter, etc. 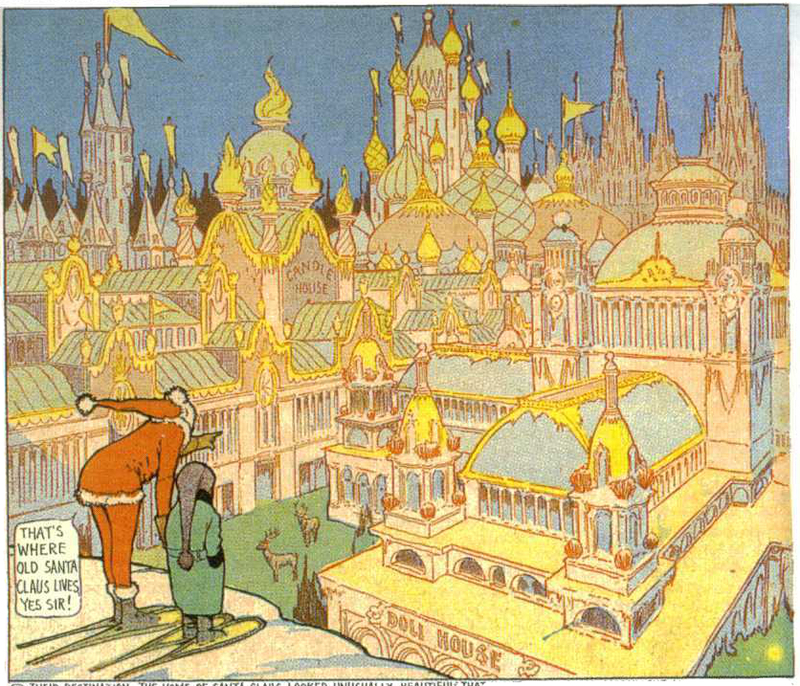 Yes, King Morpheus looks a lot like Santa, but there are clear differences in how McCay draws the two. The first Thanksgiving week strip had the house being devoured by a giant turkey and Nemo falling into a lake of cranberry sauce. It was also the first in which his parents took part in the dream, instead of just showing up in the last panel. Flip later becomes Nemo’s friend rather than his rival, and I understand that a portion of the strips starting in 1908 take place in a dream version of New York City instead of Slumberland. I also watched the animated film from the early 1990s, and have to say it came across as a case of too many cooks. It had some big names involved with it: Ray Bradbury and Chris Columbus both contributed to the screenplay, Hayao Miyazaki worked on it until he quit and cited it as the worst experience of his professional career, and the Sherman Brothers wrote the songs. What resulted was a decent effort with cute visuals, but for a movie about dreams it lacked somewhat in magic. The plot involves King Morpheus selecting Nemo as his heir, and giving him a golden key that can unlock any door in Slumberland (they haven’t heard of the Fourth Amendment there, I guess) but warning him not to use it on one particular door. Flip, who here has the voice of Mickey Rooney, convinces Nemo to open the forbidden door, thereby allowing the residents of Nightmare Land to kidnap Morpheus. He doesn’t appear to be in league with Nightmare Land; he’s just a general troublemaker, and Nemo apparently goes along with anything. To be fair, his name DOES mean “no one”; even in the comic he’s more someone whom things happen to, rather than an active protagonist. Although there are story arcs in the strip, it’s primarily episodic, so trying to come up with enough plot to fill a full-length film would have been challenging in any case. 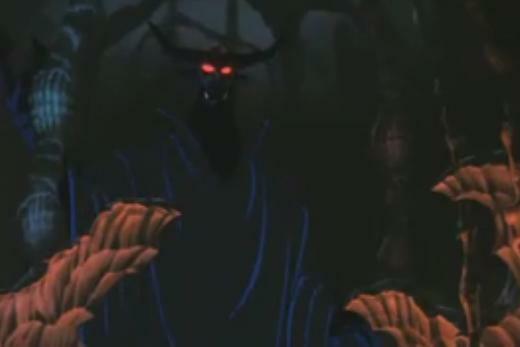 The Nightmare King, an original character in the movie, does look pretty cool, though. The visuals also include the walking bed and Gertie the Dinosaur, star of an early animated short created by McCay. It also gives names to two characters who had previously been nameless, calling the Princess Camille and Nemo’s father Ralph. The Nintendo game was intended as a tie-in for the film, but while it came out in Japan after the movie, in the United States the game came first. 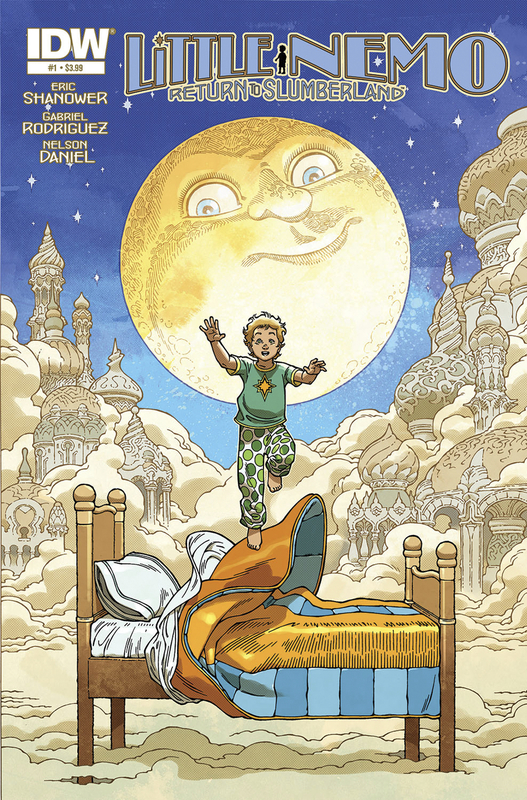 The new series, Return to Slumberland, is very much in McCay’s style with a few updates. The colors are bolder, although that could be partially because the original drawings aren’t a century old. I’m kind of disappointed that Eric isn’t doing the art, although it does seem pretty reminiscent of his work. Then again, I mostly know Eric’s work from his Oz illustrations where he’s largely drawing more ornate and detailed versions of what John R. Neill did, and McCay worked in a similar style to Neill. L. Frank Baum is known to have mentioned at some point that he would have preferred McCay as the illustrator for the Oz books, but I doubt he was ever approached. I’m not sure Reilly & Britton could have afforded him. The Return comics introduce a new protagonist, James Nemo Summerton, who mentions that his dad actually named him after the original comic. He prefers to go by Jimmy, but the inhabitants of Slumberland insist on calling him Nemo anyway. His annoyance at the dream people not taking his feelings into consideration is part of what leads him to go off with Flip at the end of the second issue, which brings him to the Tessellated Tower in the third. This entry was posted in Art, Cartoons, Christmas, Comics, Dreams, Eric Shanower, Holidays, John R. Neill, L. Frank Baum, Oz, Oz Authors, Thanksgiving, Video Games, VoVat Goes to the Movies and tagged chris columbus, coney island, cupid, father time, flip, gabriel rodriguez, gertie the dinosaur, hayao miyazaki, jack frost, king morpheus, little nemo, little nemo in slumberland, little nemo the dream master, little nemo: adventures in slumberland, little nemo: return to slumberland, mickey rooney, nelson daniel, nightmare king, nintendo power, princess camille, ray bradbury, santa claus, sherman brothers, Slumberland, super mario bros. 3, winsor mccay, world's columbian exposition. Bookmark the permalink.